It is any better than the disposable version? 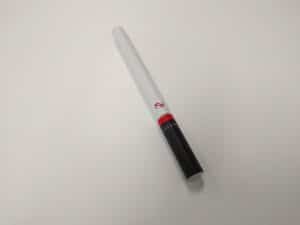 First of all, please read my review of the Smoke NV Disposable if you haven’t done so already. You’ll learn a lot about Smoke NV’s perspective on e-cigarettes with nicotine. 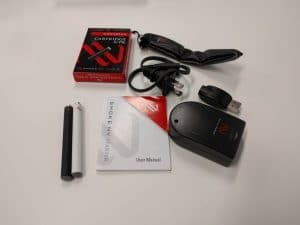 Now, I’m not expecting much, but since I bought it I might as well review it: the Smoke NV Rechargeable starter kit. 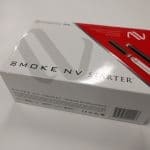 As usual with Smoke NV, you get very nice packaging and impeccable branding – this thing looks really good. While everything else seems to be high-quality, the wall charger looks and feels extremely cheap. It’s about as generic as can be. It also comes with a tacky faux-leather pouch you’re supposed to use to carry your e-cigarette around – please don’t! I can’t think of anyone who’d want to use that instead of a proper case or PCC. This is your average KR808D-1 battery, but it’s a sealed variant with a nice finish. I don’t think you can expect quality control problems with Smoke NV. It’s slightly longer than a V2 Classic standard battery, but that’s not a real issue either – it’s a great size. Have I said that it looks good? It’s a striking yet simple design. So far, it’s great! But how does it vape? 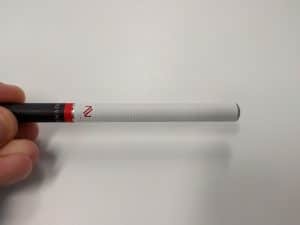 Well, you get less vapor than with competing products, and even less than with the Smoke NV Disposable. 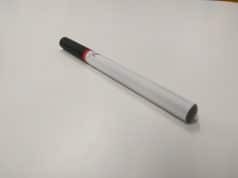 Besides that, it feels and tastes pretty much the same as the disposable variant, and that’s a bad thing: because it doesn’t contain nicotine, you get virtually zero throat hit. 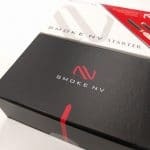 Of course, it won’t help with your nicotine cravings either – while Smoke NV pretends that it’ll satisfy smokers just as much as your regular e-cigarette, I can tell you that it’s certainly not the case for me! This would actually be a decent deal if they sold blank cartridges – but you’re stuck with nicotine-free flavors. 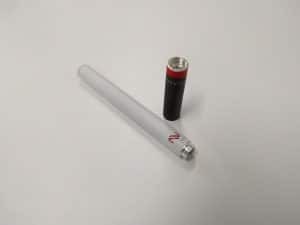 My biggest issue with the Smoke NV Rechargeable is that it comes from a company who is using scare tactics in order to lure you away from (better) competing products. 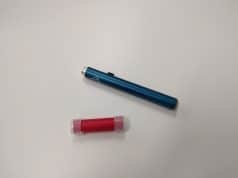 As I said before, there’s nothing wrong with a nicotine-free product – but I don’t think that’s the right way to try vaping, and I certainly don’t think that this kind of marketing is fair to consumers. 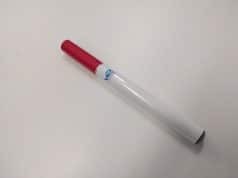 If for some reason you like their disposable e-cigarette, this is a cheaper option. Otherwise, look elsewhere!